The legendary Music Keys have been hidden in Truffle Towers for many years. A mysterious figure breaks into the Towers and steals the keys, unleashing the power of dance upon the world. Mario sets out to recover the Music Keys from the mysterious theives. 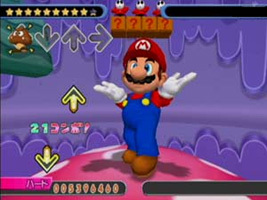 Packaged with the GameCube Action Pad dance mat controller, you have to move your feet onto the four buttons to match the direction icons as they scroll over each marker. You score based on correct moves and accuracy, allowing you to progress through songs and special minigames. The music is all remixed Mario songs and classical music. As you reach songs during the game you unlock them to play whenever you like. The songs in this game are all remixes of Mario songs and classical music (and, in one case, both). Ground theme from Super Mario Bros. (NES). Eine Kleine Nachtmusik by Mozart. The start of the song was also used in the original Mario Bros. This remix starts with the 8-bit arcade music. The theme from Wrecking Crew (NES). Athletic theme from Super Mario Bros. 3 (NES). Athletic theme from Super Mario World (SNES). Overworld theme from Super Mario World (SNES). Underwater theme from Super Mario Bros. (NES). Overworld theme from Super Mario Bros. 3 (NES). Overworld theme from Super Mario Bros. 2 (NES). Title and game theme from Donkey Kong (Arcade). Main theme from Wario World (GC). Music from Mario Party 5 (GC). Ms. Mowz's theme from Paper Mario: The Thousand-Year Door (GC). Fever music from Dr. Mario (NES). Toad's Turnpike theme from Mario Kart 64 (N64). Title theme from Super Mario World (SNES). Insert Disk music from the Famicom Disk System which featured Mario and Luigi.